Can you feel that in the air? No, not smell of pumpkin spice lattes. No, not the chill of snowfall in the early days of autumn. No, not the sound of sleigh bells in the middle of October – Christmas is still two-and-a-half months away, for crying out loud! We’re talking about Halloween! It’s almost Halloween. The air feels spooky. That’s what we were getting at. Ahem. Anyway. 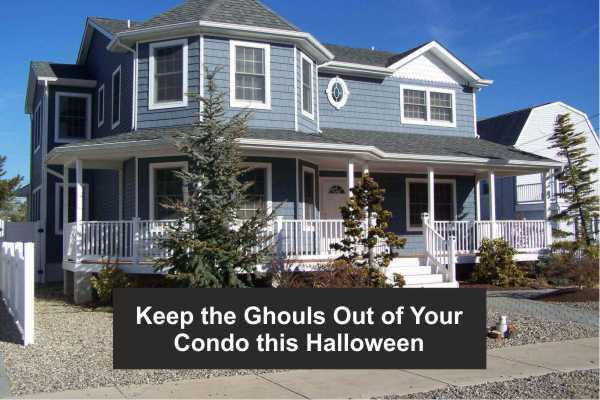 With the feeling of Halloween in the air and the happy cries of little ghosts and goblins soon to be ringing through the streets on the night of October 31st, it’s more important than ever that your condo board and condo management company make residents aware of the various policies and procedures in place to keep your building a safe haven from ghosts, ghouls, and more-corporeal security threats on All Hallow’s Eve. Follow along, and we’ll walk you through everything you need to know to keep your condo safe from hauntings and break-ins this October. Don’t let strangers into the building. This is important – no matter how cute they might be! Letting in strangers (even just one) compromises the security of the building and puts everybody at risk. Ensure your condo security system is up and running. Consider running a few spot-checks on your various cameras, sensors, and locks before the 31st, just to be sure everything is in good working order. Set up a community watch. One of the great things about tightly-knit condo communities is that everybody’s eager to have everyone else’s back. Take advantage of this and see about setting up a condo community watch, specifically on nights like Halloween. Hand out candy at the front of the building. Your building can still get into the trick-or-treating spirit of the season – just keep security in mind! Hand out candy at the front of the building, so that you don’t have a series of strangers roaming the halls and potentially causing trouble all night long. Remind residents of the bylaws – specifically, those involving exterior decorations. As much fun as it is to transform your home into a haunted house on Halloween, it’s important to keep your building’s bylaws in mind. Check to make sure you can decorate your door or balcony before hauling out those cobwebs and skeletons to save yourself some heartache. Lay down the law on door-to-door trick-or-treating in your building. Some buildings are perfectly fine with residents trick-or-treating door-to-door on Halloween, while others are most definitely not. Even if your condo falls into the latter camp, there are still plenty of ways to embrace the spirit of the season – consider throwing a Halloween party in your condo’s common spaces for everyone to come out and enjoy! And there you have it! Get these guidelines out there and circulating for your residents nice and early, and you’ll be able to head into the 31st confident that it’ll be a spooky, worry-free evening for all residents. Have some more questions about setting your condo up for scary success on Halloween night? Pick up the bone – we mean, phone! – and give us a cackle – err…call! – at Catalyst Condo Management. We’ll do what we can to guide your crypt – condo! Not crypt, condo! – towards a safe and happy Halloween!